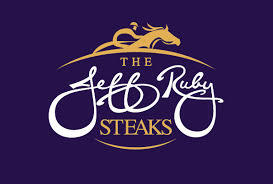 It is hard not to love the play on words that Turfway Parks Spiral Stakes will now be known as the Jeff Ruby Steaks. In a press release, Turfway Park announced Jan. 25, that Jeff Ruby Culinary Entertainment has signed a three-year agreement to sponsor the Northern Kentucky Thoroughbred racetrack’s Kentucky Derby prep race. Established in 1972 as the Spiral Stakes, the grade 3 race will be known as the “Jeff Ruby Steaks,” which plays on the foundation of restaurateur Jeff Ruby’s national acclaim. The agreement commences with the 47th running of the race on March 17. “We feel great about partnering with Turfway on its biggest day of the year. We both have strong brands with deep community roots and this is a natural fit. There are such terrific people involved on all sides of this and we can’t wait to bring the Jeff Ruby Experience to what has been a fantastic event for so many years,” said Ruby. In addition to sponsoring the race, Jeff Ruby Culinary Entertainment will provide all the food served in the VIP Tent on race day. Rising along the homestretch of the one-mile racetrack, the vast, lavishly decorated tent seats 1,500 guests and has long been the place to see and be seen on race day. While the name of Turfway’s Derby prep race has changed over the years, its place in Northern Kentucky tradition and racing history has continued uninterrupted since Big Dot won the inaugural running in 1972. The race first sent a contender to the Kentucky Derby in 1976, when Inca Roca finished seventh of nine. Two Kentucky Derby winners have prepped in the race: Lil E. Tee in 1992, the only Kentucky Derby win for legendary Hall of Fame jockey Pat Day; and Eclipse champion Animal Kingdom in 2011, the first horse to win the Derby after never having run on dirt. Other Eclipse champions to come out of the race include Preakness and Belmont winner Hansel, Preakness winner Prairie Bayou and 11-time Grade 1 winner Serena’s Song, the only filly to win the Turfway prep.